iPhone 4: A game changer. Again. Apple’s annual developer conference WWDC started today in San Francisco with the “official” unveiling of the latest iPhone 4 and iOS 4 by Steve Jobs. In keeping with Apple’s mantra of innovation and usability, iPhone 4, is loaded with smartphone technology firsts. Much awaited features include a front-facing camera together with a rear-facing 5 megapixel camera, 5x digital zoom, HD movie capability, LED flash, 3-axis gyro, compass, high-res retina display, noise cancellation and a larger battery for longer battery life. All these features have added fuel to the ongoing competition between leading smart phone vendors like Apple and Google. But it’s clear that Apple has raised the bar for innovation and usability on the mobile platform yet again. 1. iBooks: This app which was initially released with the iPad and will now allow reading PDFs and the same copy of any book across multiple Apple devices (iPhone, iPad, iTouch). 2. iMovie: For amateur movie makers, we’ll now be able to create, edit and share videos right from the device. 3. FaceTime: Video chat is finally here with FaceTime. Today this app works on wi-fi only. Of course, you need another friend with a iPhone 4 to vchat with. I hope that Mr. Jobs is serious about his proposal to make FaceTime truly an open international standard. Despite the game changing potential of the new iPhone, the demands of smart apps on this device may be hard to satisfy with the new limited data plans that come with it. Hopefully, as usage of data-intensive apps (e.g VoIP, Maps, Movies, Video) on smart phones goes up, US network carriers will be encouraged to provide more generous plans. This entry was posted in Apple, Innovation, iPhone, OpenStandards and tagged Apple, Innovation, iOS, iPad, iPhone, OpenStandards on June 7, 2010 by Alolita Sharma. What’s on the agenda? Lots of cool stuff. Here’s the link. The event starts on Friday evening with a mixer and concert. Saturday and Sunday are hackathon days when you roll-up-your-sleeves, form your team, brainstorm and write your code. As in previous years, the deadline for project submissions is Sunday 2pm. Each team shows off their project app from 2-5 pm. And then come the awards, applause and appreciation from the DevCamp community, which makes it worth every minute you spent at the camp. So, if you’re in the Bay Area this weekend, drop by the Yahoo! campus and join the party. 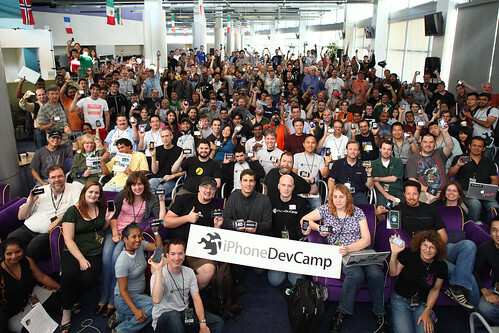 Remember the event is not free this year – registration is $50 and you can register at the iPhoneDevCamp website. See you at the DevCamp! This entry was posted in Apple, Barcamp, Collaboration, Community, Contribution, Entrepreneurship, Innovation, iPhone, OpenSource, Unconference, Web 2.0 and tagged Collaboration, Community, Innovation, iPhone, OpenSource, Unconference on July 28, 2009 by Alolita Sharma. Aneesh Chopra is the first US Federal Chief Technology Officer. He’s 37 years old, a Harvard graduate, a successful CTO at the state level, and an American of Indian origin. A crescendo of praise for this new star is rising. But it is also raising up every technology leader’s wish-list for fresh consideration by the top US technology policy and implementation machinery. From big bloggers like Tim O’Reilly to Intel’s Craig Barrett to VC Vinod Khosla, everyone has admiration… and expectations. Mr. Chopra is reported to understand the power of today’s new trends in the technology ecosystem – collaboration, open content and the Internet. He‘s in a position to make wise choices among competing IT agendas, where both action and vision matter. Let’s hope he applies the best information technologies to the real problems he’s mandated to solve. For the benefit of all of us. This entry was posted in Collaboration, Entrepreneurship, Innovation, OpenGovernment, OpenSource, OpenStandards and tagged Collaboration, Entrepreneurship, Innovation, OpenGovernment, OpenSource, OpenStandards on April 20, 2009 by Alolita Sharma.